Out of 24 listed Public sector Banks, Vijayabank is the 18th ranked Bank in terms of Asset size. Considering the Asset quality, the Bank ranked 4th in terms of NNPA. The Bank has NNPA of 4.74% compared to IOB which had the highest NNPA at 14.3%. Also, interesting, though being small, it has the highest NIM of 2.85% in the last quarter compared to the least NIM reported by United Bank at 1.18%. 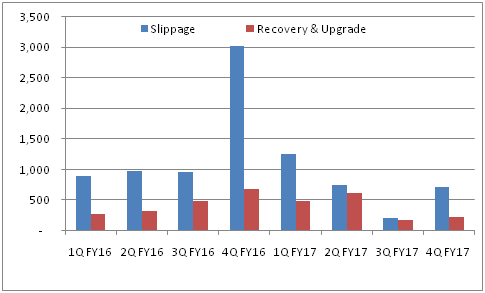 Vijayabank loan book portfolio has gradually been seen to recognize less of slippages and more of recoveries thereby indicating improvement in asset quality further. For 2 consecutive quarters, the Slippage to recovery ratio has been around 1.2 times which is the least in the industry. Not only this, the bank Slippage itself amounted to mere 200 cr in Q3FY17 which again is amongst lowest in the Public sector banks. For this reason, we have been continuously recommending Vijayabank for investment purposes. 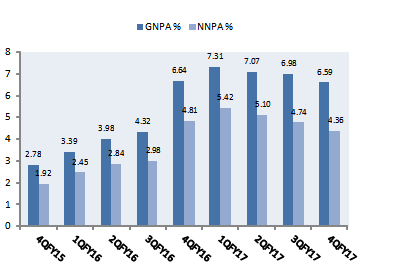 Currently, the slippages has temporarily increased on account of demonetization but the asset quality has further improved on sequential basis with GNPA at 6.59% against 6.98% and NNPA at 4.36% against 4.74%. Focus of management is growing retail book going forward hence we expect 8 to 10 percent credit growth in FY18. Assets quality is likely to continue to improve going forward but we are cautious for the whole scenario of assets quality in PSU banking. We initiated this stock at the price of Rs 48 which has almost doubled till now. The stock is currently trading at (1.3x/1.2x PV FY17/FY18E) and valuation has got stretched which leaves us with little upside, hence we recommend to partly book profit on this stock and hold for the rest with the target price of Rs 98.